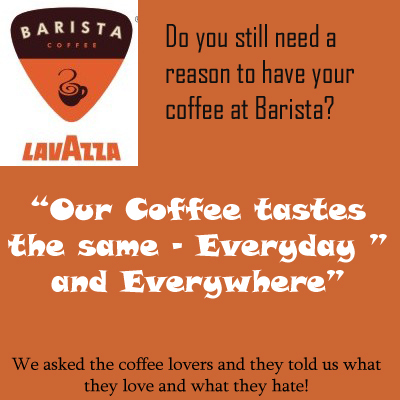 Campaign: Barista Lavazza pitching for the consistency and quality of their coffee across their outlets as compared to their competitor and biggest player Cafe Coffee Day. This would be a comparative advertisement campaign which would showcase that the customers get the same taste and quality of their favorite coffee in all the outlets of Barista, wherever it may be! TG: The target group is young, 16- 35 years old, urban, educated, loves café culture, particular about their coffee, frequents cafes – usually has their coffee in different outlets in same city or different cities. Discovery: A café chain provides the same coffee and experience across its outlets and gives you a feeling of familiarity. If the core product is not of same taste and quality in all the outlets of any food/café chain, it ends up becoming a very big bad experience and disappointment for the customer. Barista undertakes a customer survey involving the café visitors across a set of cities. The survey would ask the customers for their experiences in different outlets. It would ask them about the taste,quality,service at various outlets, primarily focusing on the product, i.e., coffee. It would also point out on the list of coffees and which ones tend to be inconsistent. For example – Café Frappe is the signature cold coffee of Café Coffee Day (CCD) and happens to be very inconsistent in taste. The results would tend to show that the quality of the coffee is very inconsistent in case of the competitor café coffee day across the outlets. The taste tends to be different and not standardized. On the other hand, the taste and quality in Barista outlets tends to be comparatively same and consistent. Based on the findings of the survey, Barista can launch a campaign. 2. Publish the survey results with campaign in print media. 4. Also launch the campaign on Social Media – Facebook and Twitter! This can be controversial, but worth a try I say! It would take some balls to launch such a campaign man. But this would certainly catch some huge eye balls and has potentials no doubt! You can follow the discussion on our Facebook Page! barista needs to target its strengths, and it definitely has an edge over CCD on this, same coffee in ccd in the same place/outlet tastes different at times! I guess a customer goes to CCD or Barista not for the consistency of coffee's taste but the ambiance and the experience..as far as I've noticed, people dont even bother about the taste of the coffee unless its really bad. So the USP is not the beverage, but the ambiance/experience/relaxation/premium treatment one gets at the coffee house. Even if Barista is able to prove that their coffee is more authentic/consistent than any other competitors, I'm not sure many will be motivated to switch from CCD to Barista. I guess we're trying to solve the wrong problem here. These are just my personal views only. I may be totally wrong, still thought of sharing my views. I've been following your blog and most of the ideas I've found excellent. I couldn't agree with this one so posting my views. Great work guys and keep'em coming! @Vatsal – We agree with your point here that most of the people come in to cafes for the ambiance and the experience of the place and hanging out with friends. But having said that – one can never forget that at the core of this service and this experience is a product which is coffee. A chain promises to give you the same product and the same experience in all of its outlets. We are not trying to solve a problem here, we are offering an idea around which a campaign can be built and trying to focus the attention of the TG towards the core product. If people have not paid attention to the fact that how the coffee tastes , as you have said, we want them to notice this. We appreciate your feedback and appreciation. Please keep giving the same regularly.